The Boston Hockey Blog has posted a list of 18 current, future and former Terriers attending NHL development camps, including 2018 draft picks Brady Tkachuk (Ottawa) and Joel Farabee (Philadelphia) as well as Shane Bowers (Colorado); Jake Oettinger (Dallas); Kasper Kotkansalo (Detroit); Dante Fabbro, Patrick Harper and David Farrance (Nashville); Bobo Carpenter and Logan Cockerill (Islanders); Drew Melanson (NY Rangers); Ty Amonte (St. Louis Blues) and former captain Brandon Hickey and graduate transfer Max Willman (Buffalo). The BHB list is being updated as more camp rosters are posted. Carpenter scored three goals in a pair of scrimmages at Islanders Development Camp on Thursday. At Avalanche camp, Bowers talked with the Denver Post about his plan to turn pro following his sophomore season. Originally drafted in the first round of the 2017 draft by Ottawa, Bowers scored 32 points (17G, 15A) en route to Hockey East All-Rookie honors. Brandon Hickey said he got texts from Eichel, Rodrigues and O’Regan as soon he got traded to Buffalo. At USA Hockey’s Select 17 Development Camp, 2019 recruit Robert Mastrosimone and 2020 recruit Braden Doyle scored goals in Columbia’s 4-3 shootout win against Orange. Mastrosimone, who scored 45 points in 60 games for the Chicago Steel last season, gave Orange a 3-2 lead in the second period, but Doyle’s unassisted tally pulled Columbia even. 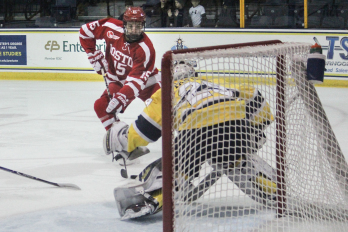 Mastrosimone also scored Orange’s only shootout goal. Mastrosimone also had a goal in Orange’s 7-3 win against Kelly. Defenseman Cade Webber, a 2020 recruit from The Rivers School, is also skating for Orange. Doyle, who plays for Lawrence Academy, added an assist in Columbia’s 5-2 win against Gold.